“Education for Life” will teach you how to maximize your child’s learning experience at every stage of their development, as well as help you reach your educational goals. Doesn’t it seem like the world is primarily focused on education these days? Wouldn’t you like to maximize the education that you and your children receive? Would you like the confidence of knowing that you are fully preparing your child for his or her career and the success that it will bring? Maybe you’re more concerned about your own education. Have you felt like you could do more for your career by heading back to school? Are you unsure of what you need to do in order to succeed in school these days? Have you been away from the school setting for a long time? No matter where you’re at in the education process or who is heading to school, "Education for Life" will answer all of your questions and make sure that you are prepared. If you are ready to learn about the education process and what you need to do to make the most of it, you need to read "Education for Life" right now. This eBook is an easy-to-follow guide that will allow you to start off on the right foot with learning. I also go through each stage of education and learning to show you the different techniques that are used in the learning system - allowing you to make the most of learning at any age. The fact of the matter is that you aren’t taught about learning, but that doesn’t mean that you can’t start now. With "Education for Life," you can stop thinking of learning as a mystery and start using the information to make better educational decisions for yourself and for your family. Many times, we can feel that the learning process is out of our control, but once you start to understand how it works and how you can help to teach your child before they even get on the bus or walk in the door, you can start to take back that control. And help make school less of a scary experience - for the both of you! Just because your child isn’t in school yet doesn’t mean that you can’t start the learning process. With these tips, you can maximize your child’s experience and ready them for any challenge that they might face. You will also learn what you can do while they’re at school to help in the educational process. When your child does enter into school, a new set of tests will be placed before them (literally and figuratively). But "Education for Life" will teach you what to expect and how to continue the learning process in your home. Learning doesn’t stop when your child gets home, no matter what age they are. 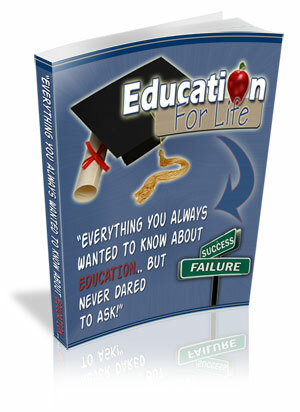 When you purchase "Education for Life" you’ll also receive comprehensive advice on college education and beyond. Many times, parents believe college education is something that is too complicated to explain, so their children just need to learn how to cope on their own - but many children are failing to succeed because of this lack of education. Or, you might think that because you haven’t gone to college that you aren’t a good source of wisdom - but that’s where "Education for Life" can help you again. But what if I want to learn more about classes for adults? Many adults too are looking to continue their education so that they can get promoted or just learn a new marketable skill. Just because you’re not the same age that you used to be doesn’t mean that you need to give up on your education dreams. With online degree programs, even the busiest person can find the time to get to class. And since learning never really ends, when you order a copy of my "Education for Life" eBook, you will also receive a special report entitled, "Finding the Money to Pay for College." Cost should never be an issue when it comes to your education or your child’s education, so this guide will make sure that you find the money that you need to make sure that you’re on the road to a lifetime of learning. I could go on forever about what is included in this 47 page report, but instead of another list, let me just tell you that you will not be disappointed by what you learn. Remember when you first went to class and you were excited to learn? Take that memory and that enthusiasm back into the present time. You CAN make the most of your child’s education as well as your own. And this information in "Education for Life" will show you how. There are many ways these days to teach your child the basics that they will have to know before they can start kindergarten. Some ways will work better than others. Since each child is different and each parent’s schedule is different, you may have to experiment with ways to teach your child. Talking and walking are the first activities your child will learn. This can be accomplished by talking to your child and also helping them walk by practicing until they can do it by themselves. But other skills such as counting, learning the alphabet, writing one’s name, and other basic skills will have to be reinforced through repetition and regular practice. You should only have your child practice for an hour or less during the day. You can break up the time throughout the day into fifteen minute segments. While there are other methods that parents can use such as simply taking a piece of paper, writing your child’s name and have them practice until they get it right, many parents want their children to learn a few skills at once. You should force your child to learn too much at one time, however. Since their brains can only retain a certain amount of information, overloading them with work can cause boredom, anger, and resentment. Take your time and teach your children in small intervals until they can grasp certain concepts. GET IT NOW FOR $ 37 ! Still not convinced? Download our special report on "Grants And Student Loans free!